Acts of violence and destruction won't be tolerated in Baltimore - Maryland gov. 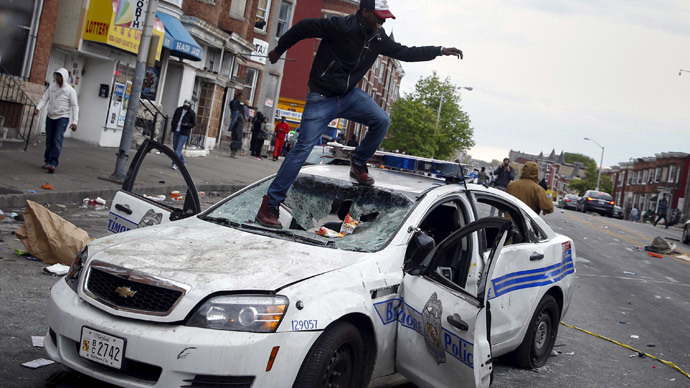 Acts of violence and destruction will not be tolerated in Baltimore City, Maryland Gov. Larry Hogan said as he announced a state of emergency after riots broke out in the wake of Freddie Gray's death in police custody. Hogan said the riot "put innocent Marylanders at significant risk” and that the deployment of the National Guard is a "last resort" to restore order to the city. "People have the right to protest and express their frustrations, but Baltimore city families deserve peace and safety in their communities," he added. "Destructive acts cannot and will not be tolerated." At the press conference, Maj. Gen. Linda L. Singh said National Guard troops will carry arms while on patrol, but only for self-defense. Earlier in the day, Hogan declared a state of emergency and activated the National Guard to help handle the unrest in Baltimore. The situation escalated dramatically on Monday after a group of school-age kids gathered at Mondawmin Malland began throwing rocks at law enforcement. Officers responded with mace and pepper spray, but the young people involved then moved to set at least two vehicles on fire, as well as a local pharmacy. Fifteen police officers were injured, a police spokesman told Reuters. Prior to the governor's statement, Baltimore Mayor Stephanie Rawlings-Blake declared a curfew will be implemented beginning Tuesday night and will last for one week. All adults and minors, outside of emergency situations, will need to be off the streets from 10pm to 5 am. She also called the rioters "thugs" several times and said it was "idotic" to think that destroying the city would lead to improvements in anyone's life. “Too many people have spent generations building up this city for it to be destroyed by thugs," she said. Rawlings-Blake also differentiated between those destroying property and causing injury from those who took to the streets without violence last week. “It is very clear there is a difference between what we saw over the past week with the peaceful protests… and the thugs who only want to incite violence and destroy our city," she said. Tensions between law enforcement and the community have risen since the death of 25-year-old Freddie Gray, who was arrested earlier this month after running away from police. He suffered a severe spine injury while in police custody and slipped into a coma upon being hospitalized. Gray died one week later. Local police have acknowledged that officers should have sought medical attention for Gray at the point of apprehension and that they failed to offer timely assistance multiple times. They also did not secure him with a seatbelt in the police wagon, which is against department policy. Both local and federal law enforcement are investigating the incident.